Motto: "Serving & Enhancing our Community With Care, Commencement & Pride"
Benicia is a waterside city in Solano County, California, United States. It served as the state capital for nearly thirteen months from 1853 to 1854. The population was 26,997 at the 2010 census. 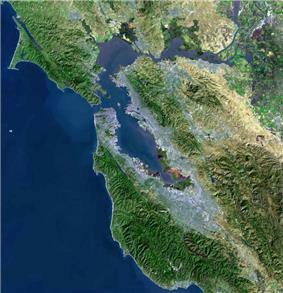 The city is located in the San Francisco Bay Area along the north bank of the Carquinez Strait. Benicia is just east of Vallejo and across the strait from Martinez. Elizabeth Patterson has served as Mayor of Benicia since 2007. The town can be divided into four areas: the East Side (east of First Street), the West Side (west of First Street), Southampton (the newer suburban neighborhoods north of Interstate 780), and the industrial park. Most of the town's older homes are on the east and west sides. Southampton contains primarily single-family housing developments and condominiums, most of which were built between 1970 and 2000. The East Side includes the Benicia Arsenal, a former United States Army armory, which was bought by the city and is now used for a variety of purposes, most notably as live-work spaces for artists. The Arsenal is home to several historic (ca. 1860) landmark buildings such as The Clock Tower, the Camel Barn, and the Jefferson Street Mansion. 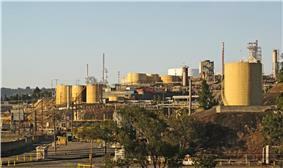 The industrial park lies to the northeast of the residential areas of the city, and includes the Valero oil refinery. The Benicia State Recreation Area is on the far west edge of the city. The City of Benicia was founded on May 19, 1847, by Dr. Robert Semple, and Thomas O. Larkin and Comandante General Mariano Guadalupe Vallejo, on land sold to them by General Vallejo in December 1846. It was named for the General's wife, Francisca Benicia Carillo de Vallejo. The General intended that the city be named "Francisca" after his wife, but this name was dropped when the former city of "Yerba Buena" changed its name to "San Francisco". So Sra. Vallejo's second given name was used instead. In his memoirs, William Tecumseh Sherman contended that Benicia was "the best natural site for a commercial city" in the region. Benicia was the third site selected to serve as the California state capital, and its newly constructed city hall was California's capitol from February 11, 1853, to February 25, 1854. Soon after the legislature was moved to the courthouse in Sacramento, which has remained the state capital ever since. The restored capitol building is part of the Benicia Capitol State Historic Park, and is the only building remaining of the state's early capital buildings, which were in San Jose and Vallejo. 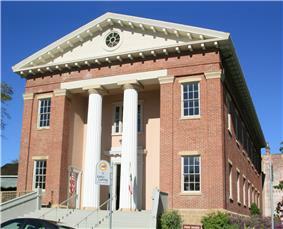 Benicia was also the county seat of Solano County until 1858, when that was moved to Fairfield. This outdoor event began in 1963 with a few collectable and antique stores displaying their items on tables outside St. Paul's Church. Today, over 300 antique and collectable dealers as well as other vendors display their wares in booths that span approximately 11 blocks of First Street. Unverified sources cite attendance in 2006 at approximately 20,000. This event is sponsored by St. Paul's Episcopal Church in Benicia. Benicia is an active sailing community. In additional to individual sailing out of the Benicia Marina, there are several organized events and competitions. During the summer months, there is a yacht racing competition on Thursday evenings sponsored by the Benicia Yacht Club. The Yacht Club also sponsors a Youth Sailing Program that offers extensive training. On the fourth Sunday in July, the Portuguese community in Benicia celebrates the feast of the Holy Ghost, commemorating the Queen Saint Isabel of Portugal, with a parade to Saint Dominic's Church followed by mass, an auction and a dance. The Holy Ghost Parade celebrated 100 years in Benicia in 2007. The population was spread out with 6,317 people (23.4%) under the age of 18, 1,923 people (7.1%) aged 18 to 24, 6,087 people (22.5%) aged 25 to 44, 9,303 people (34.5%) aged 45 to 64, and 3,367 people (12.5%) who were 65 years of age or older. The median age was 42.9 years. For every 100 females there were 92.7 males. For every 100 females age 18 and over, there were 88.9 males. In the city the population was spread out with 27.1% under the age of 18, 6.5% from 18 to 24, 28.3% from 25 to 44, 28.8% from 45 to 64, and 9.3% who were 65 years of age or older. The median age was 39 years. For every 100 females there were 94.7 males. For every 100 females age 18 and over, there were 90.1 males. Benicia has no transit by train, but offers bus transportation through SolTrans. The Benicia–Martinez Bridge provides an automobile and rail link over Carquinez Strait, as well as bicycle and pedestrian lanes which opened in August 2009. Two blocks from the main downtown district, the Benicia Marina is a full-service marina, offering a fuel dock, pump-out station, launch ramp, general store, laundry, restrooms and showers. ^ Sherman, William Tecumseh (2011-11-21). The Memoirs of General W.T. Sherman: All Volumes (Illustrated) (Kindle Locations 1333). . Kindle Edition.